Wednesday, April 1 – April 24. A month of free yoga at Sacred Earth Temple, Haiku. Classes are Mondays, Wednesdays, Fridays. 10 am – noon. Free, though donations are accepted. Friday, April 3. 5:30 pm - ? Imua Fantasia Ball. Gala Fundraiser and Party for Imua Family Services. Hyatt Regency Maui, Kaanapali. Saturday, April 4, 9 am – 4pm. Maui County Agricultural Festival, better known as Ag Fest. Maui Tropical Plantation, Wailuku. This is a huge event with lots of demonstrations, free activities, entertainment, produce booths and giveaways. Free for children under 18 and seniors over 65, $3 admission for adults. Saturday, April 4, 9:30 am - 4:30 pm. Kuhio Day Celebration in Wailuku, Paukukalo Homestead Park. (Make sure to check the location of the park if you are not familiar with the neighborhood.) Daylong celebration honoring Prince Kuhio, the father of the Hawaiian homestead program. Hula, arts and crafts, performers, food, and health screenings. FREE. Sunday, April 5, 8 am – noon. 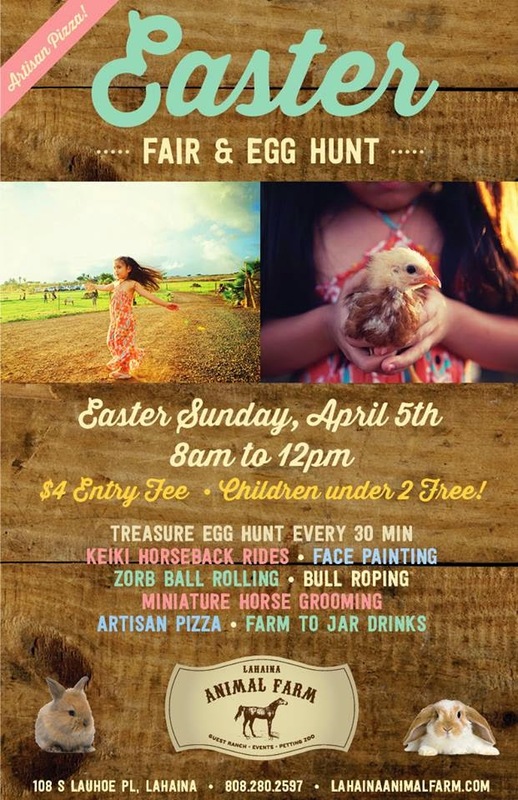 Easter Fair and Egg Hunt at Lahaina Animal Farm. 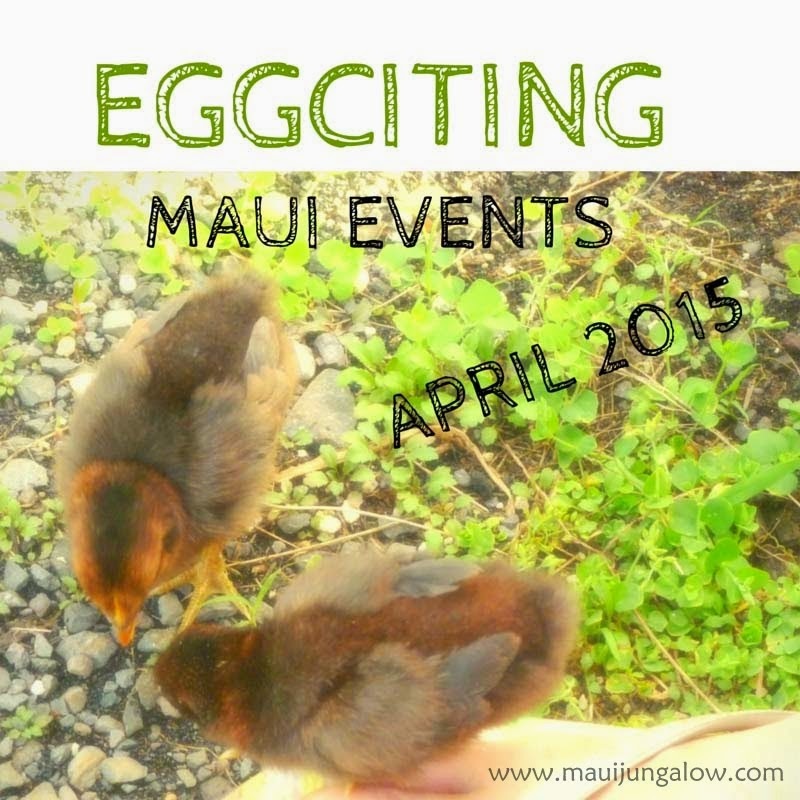 Fun activities for the keiki, new egg hunt every 30 minutes. Horseback rides, face painting, horse grooming. $4 admission. Sunday, April 5 – May 3. Various Times, Maui Arts and Cultural Center. Art Maui, a prestigious juried art show, opens on April 5. FREE! Friday, April 10, 6 pm – 10 pm – through May 2. 10 am-6 pm. Maui Mall, Kahului. Art of Trash annual juried art show of items made from trash. Maui Trashion Show and Live Entertainment on the Art of Trash Opening Night, April 10. FREE! Friday, April 10, 5- 9 pm. 3rd Annual Maui Classic Car Show. Lahaina. FREE! Live music, food to purchase, art galleries are open late since it's part of the Second Friday Lahaina Town Party, and there are classic cars cruising down Front Street. Saturday, April 11, 6 - 9 pm. The Ultimate Ocean Vodka Cocktail Showdown. Sheraton Maui, Ka'anapali. Six finalists will be competing for prizes, and paired with celebrity chefs. Sunday, April 12. 11 am – 12 pm. Detox to Retox. A rocking yoga class, followed by beer tastings! (This is how to get your boyfriend or husband to take yoga.) Maui Brewing Company, Kihei. Friday, April 17, Soul Kitchen Maui at Makawao Third Friday Party, 5:30-8:30pm. Makawao. Enjoy three hours of band Soul Kitchen Maui at the main stage on Baldwin Avenue. (I first hear them play at the Maui Arts 20th Birthday Party, and they are amazing.) FREE! Friday, April 17, Chinese Kite Festival, 10 am – 8 pm. Lahaina, Wo Hing Museum and Ka’anapali Beach. Celebrate the world of kites during this traditional Chinese festival. Chinese music and entertainment and kites to purchase. Kite flying event at the beach. FREE! Friday, April 17. 5:30 – 8:30 pm. Empty Bowl Project. Star Noodle. Lahaina. Artists and chefs are teaming up for this special fundraiser in which hand crafted ceramic bowls can be bought for $25 to support Maui organizations, then filled with noodles and different flavorings during the event. Saturday, April 18 - Sunday , April 19. Banyan Tree Birthday Celebration. Lahaina. The banyan tree in Lahaina is a landmark tree that is over a 100 years old. Celebrate its birthday weekend with live music, Maui artists, a silent auction, and a magic show. Annual event the third weekend in April. FREE! Saturday, April 18. Kamehameha Schools Ho’olaulea, Kamehameha Schools Maui Campus, Kula. 9 am -3 pm. Fun for the family with Hawaiian entertainment, food booths, activities. FREE! Saturday, April 18. Aloha Maui Music Festival. 10 am - 5 pm. Maui Nui Botanical Gardens, Kahului. A benefit for the UH Maui College Music Department. Lineup of great entertainers. $10 in advance, $15 at the door. Keiki go for free. Sunday, April 19. 10 am – 6 pm. 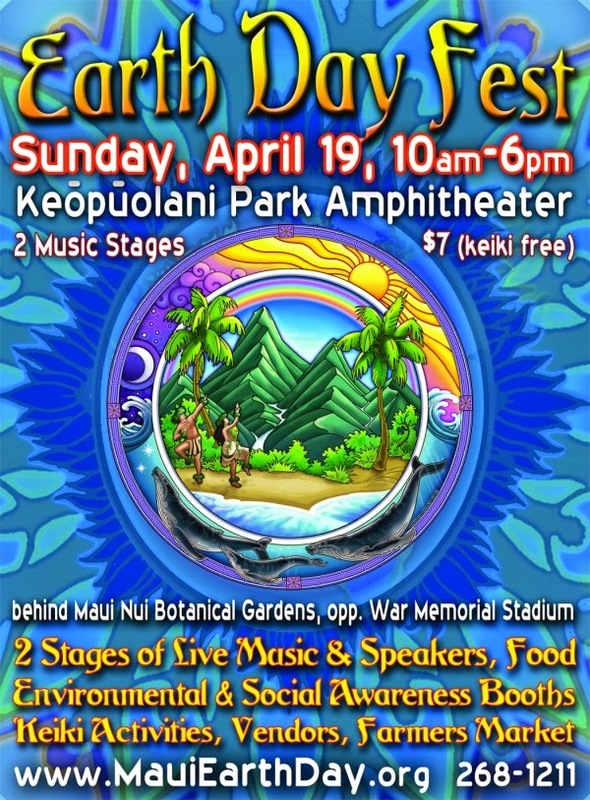 Maui Earth Day. Keopuolani Park, Wailuku. $7 adults, children are free. Wednesday, April 22. 9 am - 7 pm. Earth Day & Music Jam at UH Maui College. FREE! Wednesday, April 22, 7 pm, Castle Theater, MACC. Maui Film Festival presents a special screening of Planetary, a fundraiser for Hawaii Farmers Union. Tickets: $30 for 2 people. Friday, April 24 – Sunday April 26. Maui Steel Guitar Festival. Ka’anapali Beach Hotel, Ka’anapali. This three-day event brings master steel guitar players and fans from around the world to celebrate the music of the Hawaiian steel guitar. FREE! Saturday, April 25, 9am – 5pm and Sunday, April 26. East Maui Taro Festival, Hana Ball Park, Hana. Free event showcasing the revered Hawaiian food crop, taro. Farmers Market, Arts and Crafts, Poi Pounding, Music and Hula. A popular family event. FREE! Saturday, April 25, 8am. 9th Annual Butterfly Effect Maui. A non-competitive event for women of all ages to SUP, paddle, or kayak from Baldwin Beach in Paia to Kanaha Beach Park in Kahului. Saturday, April 25, 9am – 5pm. Haiku Ho’olaulea aka Haiku Flower Festival. Haiku Elementary School, off Pauwela Road, close to Hana Highway. This Spring Fair and Fundraiser is a grassroots community event with entertainment, lots of vendors, and history booths about the “good old days” of Maui. FREE!